Experience the confidence, reliability and proven performance of Honda outboards during the Honda Get Onboard Event. 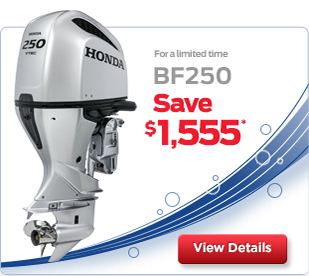 Designed to be quiet, fuel-efficient and environmentally responsible, Honda outboards deliver dependable power you can count on for years to come – now with great offers you won’t be able to resist. 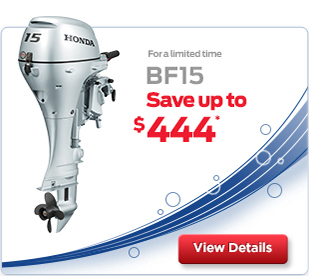 Offers apply to eligible retail purchase agreements on select models of new (not previously registered) Honda outboards for a limited time, while supplies last. All prices shown do not include freight and PDI, or applicable sales taxes and are not applicable in Quebec. Dealer may sell for less. “Save up to” amounts represent a discount that is deducted from the manufacturer’s suggested retail price before taxes. Actual savings may vary by dealer and model. Prices/specifications subject to change without notice. Honda Canada reserves the right to change, extend or limit its offers at any time. Dealer order or trade may be necessary. Offers valid from April 1, 2019 to June 30, 2019 inclusive. At participating Canadian Honda Power Equipment and Marine dealers only excluding Quebec. Models and colours may not be exactly as shown. Errors and omissions excepted. 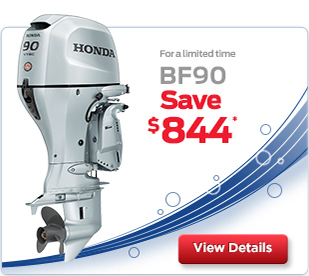 See your Honda Power Equipment and Marine dealer or honda.ca for full details. 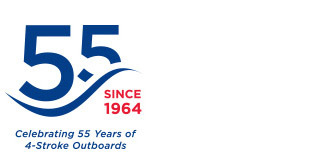 Never operate your Honda outboard under the influence of drugs or alcohol. Always wear a personal floatation device while boating and read your owner’s manual before operating your Honda outboard.